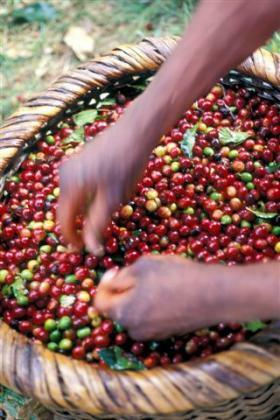 Coffee was first discovered in Northern Africa in an area we know today as Ethiopia. A popular legend refers to a goat herder by the name of Kaldi, who observed his goats acting unusually frisky after eating berries from a bush. Curious about this phenomena, Kaldi tried eating the berries himself. He found that these berries gave him a renewed energy. The news of this energy laden fruit quickly spread throughout the region. Monks hearing about this amazing fruit, dried the berries so that they could be transported to distant monasteries.They reconstituted these berries in water, ate the fruit, and drank the liquid to provide stimulation for a more awakened time for prayer. From there, coffee traveled to Turkey where coffee beans were roasted for the first time over open fires. The roasted beans were crushed, and then boiled in water, creating a crude version of the beverage we enjoy today. Coffee first arrived on the European continent by means of Venetian trade merchants. Once in Europe this new beverage fell under harsh criticism from the Catholic church. Many felt the pope should ban coffee, calling it the drink of the devil. To their surprise, the pope, already a coffee drinker, blessed coffee declaring it a truly Christian beverage. Coffee houses spread quickly across Europe becoming centers for intellectual exchange. Many great minds of Europe used this beverage, and forum, as a springboard to heightened thought and creativity. In the 1700's, coffee found its way to the Americas by means of a French infantry captain who nurtured one small plant on its long journey across the Atlantic. This one plant, transplanted to the Caribbean Island of Martinique, became the predecessor of over 19 million trees on the island within 50 years. It was from this humble beginning that the coffee plant found its way to the rest of the tropical regions of South and Central America. After the historic Boston Tea Party, coffee was declared the national drink of the then colonized United States by the Continental Congress, in protest of the excessive tax on tea levied by the British crown. Today, coffee is a giant global industry employing more than 20 million people. This commodity ranks second only to petroleum in terms of dollars traded worldwide. With over 400 billion cups consumed every year, coffee is the world's most popular beverage. If you can imagine, in Brazil alone, over 5 million people are employed in the cultivation and harvesting of over 3 billion coffee plants. Sales of premium specialty coffees in the United States have reached the multi billion dollar level, and are increasing significantly on an annual basis.